Transatlantic travel is about to get a whole lot better. Bitter rivals British Airways and Virgin Atlantic are launching all-new cabins in their hangar-fresh Airbus A350 jets that will start flying between New York and London this Autumn. 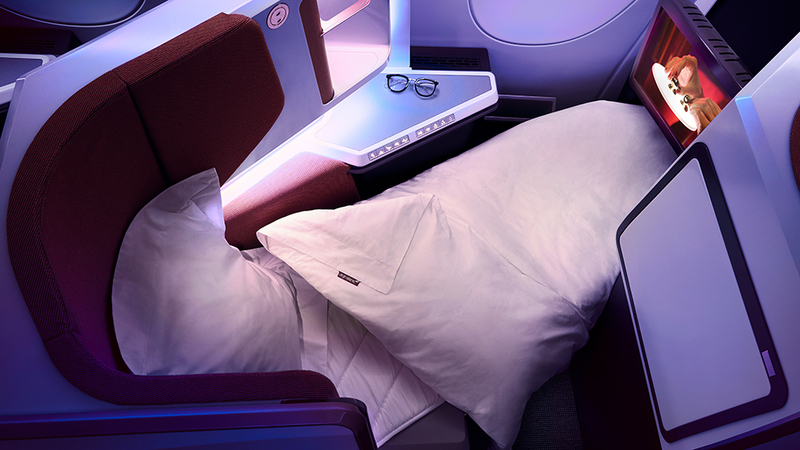 In Virgin’s Upper Class cabin replaces the decades-old side-by-side seat/bed suites that face into the cabin in a herringbone pattern. In their place are 44 all-new, separate suites arranged in a 1-2-1 configuration. Each faces forwards and diagonally outward toward the large windows. 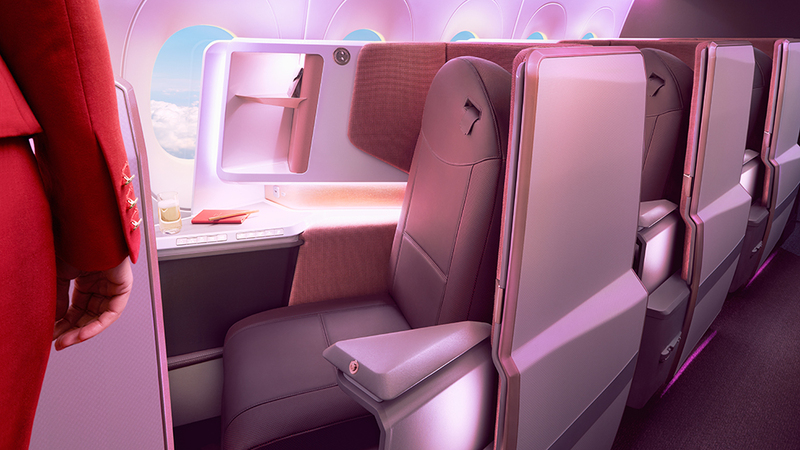 The old cappuccino colour palette has been replaced with white and coral pink and offset with claret leather, which gives the cabin a brighter, warmer look. The 50cm-wide seat slumps down to create an 208cm bed which means no more flipping over the seat back. The new suites also feature a “half privacy” door, which means what it sounds like: it only closes halfway; an 18.5-inch TV screen; personalised mood lighting; a deep mattress, duvet and pillow; the chance to pre-order personalised pyjamas – trousers or shorts, long-sleeve top or T-shirt; and toiletries in large sizes that passengers will be encouraged to keep, so they don’t have to pack any. To minimise waste, the toiletries will be offered in a basket, so passengers only take what they need. There will be simpler, healthier food, to reflect changing tastes. Virgin has scrapped its trademark bar and replaced it with the Loft, an eight-seat lounge. Passengers can watch films or live sports on the 32-inch TV screen using bluetooth headphones. There’s also a stand-up desk where two people can work side-by-side on their laptops. 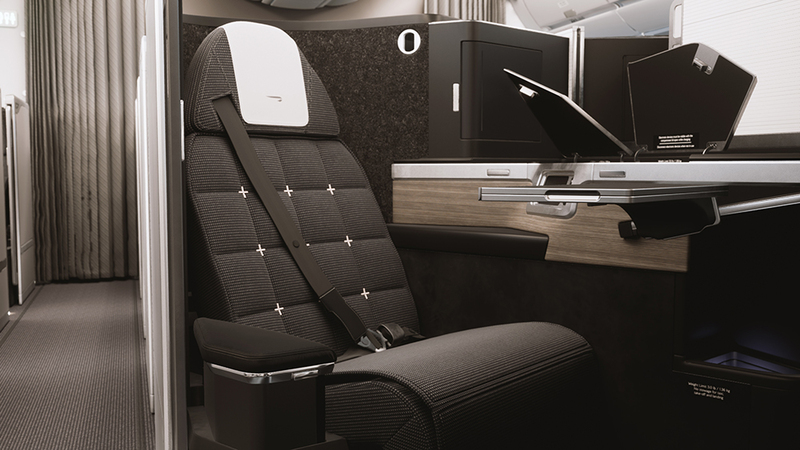 British Airways’ new Club World business-class suite on its A350 is a huge improvement on the back-to-front seat pairs in (usually) a 2-4-2 pattern, which many passengers found impersonal and cramped. 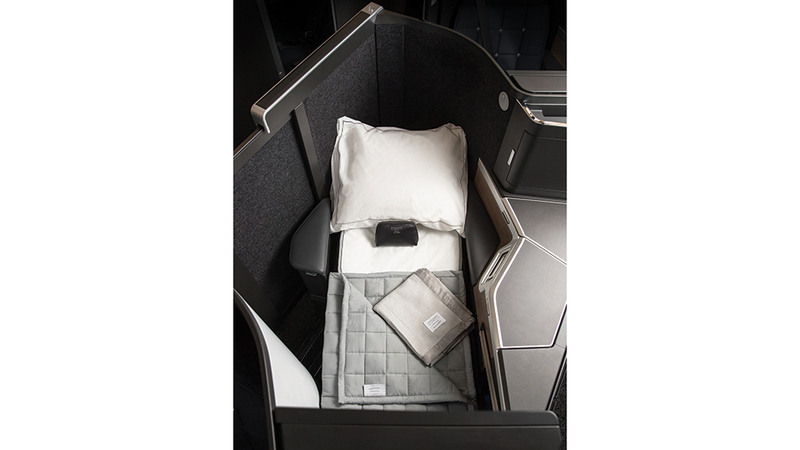 The new suites—which are a 53cm wide and 200cm long when in bed mode—are arranged in a more desirable 1-2-1 configuration, giving every passenger direct aisle access. Unlike Upper Class, the suite has a door that fully closes. The TV screen has almost doubled in size to 18.5 inches and there’s 40 per cent more storage, a vanity unit and a mirror. The suite is lined with felt to help dampen noise from the engines, not to mention the snoring passenger in the next suite.